¡Bienvenido a Paraguay! Paraguay is a colorful nation perfect for anyone who loves the exploring the outdoors and who wants to learn more about history. Study and volunteer in Paraguay to experience all that this beautiful country has to offer! Welcome to the heart of South America! The name Paraguay is derived from an ancient word in Guarani, and while no one knows the exact translation, many translate it as "many rivers" or "river of many inhabitants". This is very lucky for the locals in Paraguay since it is a landlocked country! In fact, Paraguay has been named one of the world's most up and coming countries to visit due to its many waterfalls. Although it is a small country, it is very proud and has a rich history as well as plenty of things to do. While on program in Paraguay, you will live with a carefully selected host family who will be able to help you improve your Spanish skills and even introduce you to their indigenous language of Guarani. In fact, Paraguay is the only country in South America to retain its native tongue: Guarani is an official language along with Spanish. Your host family will also surely introduce you to many Paraguay customs including their incredible food! Chipa, a bagel like bread with cheese, is an all time favorite of the locals. Another favorite is called mate (pronounce mah-tay): you'll be served a strong herb tea made from mate leaves. Like spending time outdoors? There are plenty of hiking and camping trails throughout the country that will bring you to their many waterfalls. Paraguay faces many problems such as deforestation, which isn't good news to the Capybara. The Capybara calls Paraguay its home and is the world's largest rodent. It looks like a giant guinea pig! Maybe outdoors are not for you, and you're more interested in arts and crafts? Paraguay women love doing lace making and embroidery as a past time and would be happy to teach you! Living in the land of "many rivers" will certainly be an experience you won't want to forget. What are you waiting for? The most popular sport in Paraguay is futbol (soccer). However rugby, volleyball, tennis, and basketball are also popular among Paraguayans! Information about visas will be provided upon enrollment. Program tuition does not include personal spending money or school-related costs such as books and school trips. Students may also need to pay an additional compulsory school fee if applicable. YFU will check with families before officially enrolling students in a school that requires an additional fee. Students in Paraguay attend school from the time they are 3 until the age of 18, when they complete their third and final year of high school. YFU exchange students may be placed in either a public or private school. All students applying for the semester or year program must be available for a mandatory 3-day National Pre-Departure Orientation, which usually takes place in mid-July. This orientation is a required part of the program aimed at preparing students for their experience overseas. All students will participate in a one-day local pre-departure orientation in May or June. 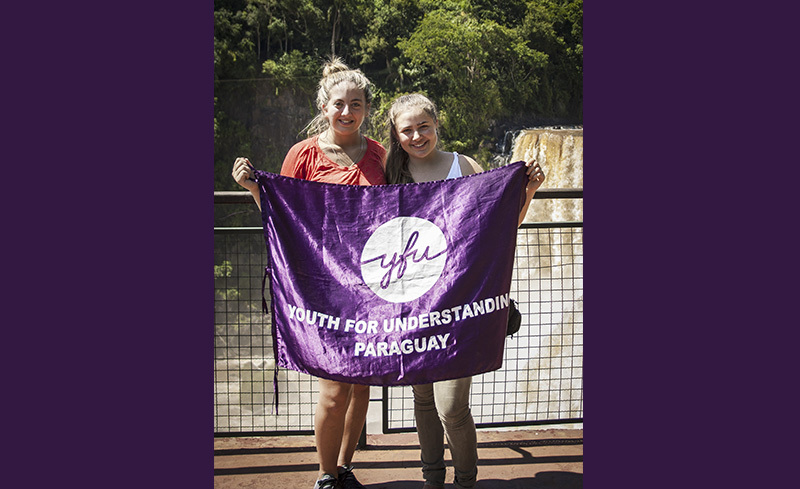 Upon arrival in Paraguay, students will attend another orientation with all YFU students participating in the program. This orientation is conducted in English and is meant to give an introduction to the country, customs, and things to expect while in Paraguay. You will also participate in a 2-week training course in which you will learn not only Spanish language skills, but also practical lessons about Paraguay by visiting museums, malls, stores, and other places around the city! All orientation costs are included in program tuition. Many Paraguayans love spending time outdoors hiking through the mountains, rainforests, and visiting natural waterfalls. Students are encouraged to get involved in any extracurricular activities offered by their host school or local community, which include clubs and sports. YFU Paraguay offers cultural trips for students while on program for an additional fee. Students may also have opportunities to travel with their host families or with YFU on organized trips during school breaks. Students will find out more about these excursions and how to sign up when they arrive in Paraguay. Students 18 - 26 are encouraged to apply for the Community Service Program in Paraguay! Students have the opportunity to live with a host family while also partnering with a local non profit to assist in community service efforts such as social work, education, childhood & adolescence, biology, and health. Students are encouraged to state their area of volunteering interest in their application so we are able to place them with an organization that meets their interests. We ask that applicants for this program are high school graduates, and while there is no formal language requirement, applicants should be willing to learn Spanish during the intensive Spanish classes that take place during the first two weeks of the program. This program offers students an incredible experience to immerse themselves in a culture while also building their resume! Spring 2019 Programs: January 31, 2001 - February 28, 2004. Fall and Summer 2019 Programs: June 30, 2001 - July 31 2004. Students who do not meet this age requirement or will graduate from high school before the start of their program will be considered for admission on a case-by-case basis. Guarani and Spanish. Previous Spanish language study is not required but is recommended. Orientation upon arrival is conducted in English. Spanish language classes are available for students wishing to participate in the volunteer program. Students are typically placed in small towns, but can be placed anywhere throughout Paraguay.